BUFFALO, NY – According to the National Institute for Occupational Safety and Health (NIOSH), 22 million Americans are exposed daily to hazardous noise on the job, putting them at risk of developing permanent, incurable hearing loss or tinnitus. An estimated $242 million is spent annually on worker's compensation for hearing loss disability. To combat these dangers, Casella CEL offers its CEL-35x series of cable-free, shoulder-mounted noise dosimeters. Amazingly compact and lightweight, these breakthrough safety tools are designed to measure the noise an employee is exposed to over the working day to uncover dangerous areas, as well as to assure compliance with strict national and international regulatory compliance protocols. "The Casella CEL-35x series is revolutionizing personal noise exposure sampling," explained Rob Brauch, Business Unit Manager for Casella CEL. "Gone are all of the hassles and safety concerns of cable-mounted microphones, yet all the essential features of 'traditional' dosimeters, such as LCD data display, on-board control keys, IS approvals, multiple metrics capture, and secure data storage, are retained." The CEL-35X dBadge series includes the CEL-350 standard and the CEL-352 Plus models. Each is available with or without intrinsic safety approvals. Both provide overall run data of dose and projected 8 hour dose values as well as the actual elapsed time average and the calculated 8 hour time weighted average (TWA) levels. An employee can comfortably wear either unit all day, simply by attaching it to a shirt, overalls or hardhat. The instrument is operated with only two buttons located on its side. Once in operation, the unit captures a time history for every noise event in a single measurement range of 65 to 140 dB, including average noise level and peak value, which is logged in one-minute values for later analysis. The CEL-350 standard model has logging of time history samples at 1 minute intervals during a run. Average and maximum noise levels with the 5 and 3 dB exchange rates as well as instantaneous peaks are saved to provide a complete time history that can be viewed in Casella CEL Insight™software. This provides a powerful analysis capability by indicating exactly when the most dangerous noise levels occurred at any specific time of day. 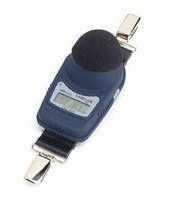 CEL-352 Plus dosimeters provide all the advantages of the CEL-350 and also give C-weighted average noise level data along with the A-weighted result to aid in the correct selection of hearing protectors following international recommendations. The instrument automatically calculates the 'C minus A' (C-A) time averaged result on-board the dosimeter and the value is displayed in the included software. For more information, visit www.casellausa.com.